Originally, these started out as a crostini with three toppings – the pea spread, a cucumber slice, and a slice of strawberry. Well, it was okay, but not very interesting… at all. So then we decided that something salty and savory was needed, like bacon. Because bacon! So smoky and crisp, how can that not add something fun to the mix? To be honest, I think strawberry and bacon are actually pretty magical together. Then we asked the very normal question – what does Sriracha whipped cream taste like? We determined that the answer was good, and interesting! So we added that to the crostini. Then we were left with a flavorful, but unwieldy appetizer. We solved that problem by slapping another slice of baguette on top and calling it a sandwich, but mini-size! You can, of course, make these as regular size sandwiches, but where is the fun in that? They’re so cute and bite size, what is not to love? Even the word mini is super fun to say! Mini! For the pea spread: Place the cooked peas in a bowl and toss with butter and olive oil. Once the butter has melted, add lemon juice, chopped mint, and parsley. Puree in a food processor or with an immersion blender. Adjust salt and pepper to taste. For the Sriracha cream: Place whipping cream, Sriracha, and lemon juice in the bowl of a stand mixer and whip on medium-high until the mixture holds soft peaks. For the bacon: Fry up bacon slices on a griddle over medium heat. Once both sides have crisped, remove from griddle and place on a paper towel. To assemble, spread the pea spread on a baguette slice. Top with cucumber, strawberry, bacon, and Sriracha cream. Finish with another baguette slice. I strangely love the sounds of these flavors all combined. And siracha whipped cream... I would love that! Woooooooooow! I mean, really. Woooooow. I am just drooling all over myself here. FABULOUS guys! These are FANTASTIC! I'm with Jen, big WOW. These are little flavor explosions! Unique and delicious! Looks so inviting and delicious...mouthwatering! How cool are these? Very posh looking too! I am going to be making them, perfect for parties. I am so intrigued by the sriracha whipped cream! These little sandwiches look so tasty. I know they taste great their adorable! Very very creative indeed!I can see that you combined your favorite flavors in this one :)Looks really good! This is soo inventive. I love the strawberry twist. I will have to try these just to see how they turn out. Pea spread! This sounds very innovative to me. These are so adorable! Sound delicious too! These sandwiches "sound" fancy but it's totally do-able! I've never thought of using pea for spread. I'm VERY intrigued. It has really good nutritious value too! Very pretty sandwiches! I love the story of how these came about. And sriracha whipped cream...totally a normal thing to invent. And by normal, I mean genius. I'm lost for words here! I'm just trying to imagine what this would taste like...guess I have to make it to find out. :P Strawberries and bacon, sriracha cream... sounds so interesting! Blimey! Would you look at those, they look and sound amazing! I love how you've arranged them, you wouldn't want to eat them. o boy...the sandwiches look really super! Oh my, oh my, do these mini sammys look delicious. Pea spread? Siracha whipped cream? I think I just entered sandwhich heaven. I have a confession, I put siracha on everything. I love the stuff and can't get enough of it. Yes to all of it! Especially Sriracha whipped cream! I can't decide to what to start making first: the pea spread or the sriracha whipped cream. What a fun mix of flavors! Bacon and strawberries? Sriracha whipped cream? You guys are geniuses! Love this. Oh, yeah!!! 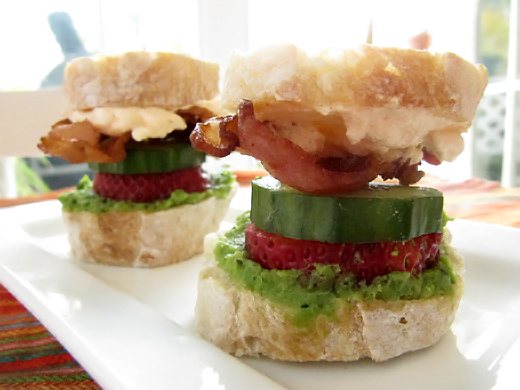 Bacon makes everything better...and these little sandwiches are anything but ordinary! YUM. Woah! This looks incredibly delicious! I would LOVE this as a midnight snack!! So cool that you added strawberries too! What a wonderful appetizer!Great for a party....printing this one! Wow, this is just a mini sandwich of absolute amazingness! love love love these!! I've never thought about bacon and strawberry together... I'm' going to trust you guys :) These are too cute and so interesting! I'm so curious about all those flavors! You had me at Sriracha whipped cream, oh this is a must try !! Sriracha whipped cream?! Awesome!!! So excited about that. This whole mini sandwich looks great, I love the sweet, savory, spicy combination you have going on here! Would love for you to stop by my blog sometime. New blog friends are the best!